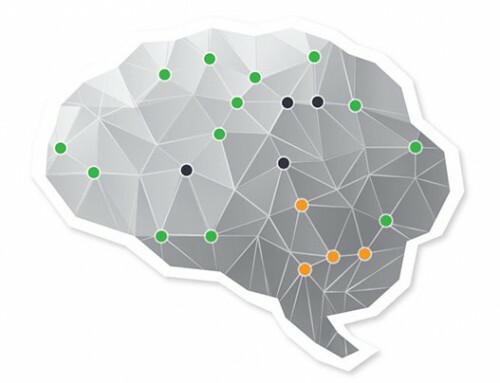 With the dazzling computer development of the recent years, the physical world and the virtual world have come even closer together. After the introduction of various mixed reality solutions, digital twins have become the new futuristic obsession of the construction sector. Developed in the early 2000s, this concept has now come into the spotlight as a technology that is even more avant-garde than Building Information Modelling. It is seen as an opportunity to enhance asset performance, help actors anticipate adverse environmental effects during the life cycle stages, forecast maintenance activities based on sensor data and bring may further benefits for built asset all across the globe. So what is a digital twin of a product, anyway? The connections of data and information that ties the virtual and real products together. Ideally, the digital twin contains all the information of the physical ‘object’. It is a representation of all its aspects – this is to say not merely a mechanical or geometric representation of an asset, but also an electronic representation including embedded software, micro software, product data, sensor data etc. More recently, in-depth studies have been devoted to the exploration of the Digital Twin in the context of IoT, Industry 4.0 and the Industrial Internet of Things (IIoT). Technologies of the ‘connected’ era allow assets to ‘live’ a virtual life as digital twins. Digital Twins have now increasingly the ability to change dynamically in near real-time as the state of the physical object changes. Sensors can collect data about the impact of the external environment onto the asset and vice versa. Imagine that your house can notify you every time when your sister in-law visits you and doesn’t close the windows in the guest room, so the average temperature in the whole house drops. Imagine that your roof can inform you about the improved sound insulation of your house ever since you changed the roofing tiles. Modern Data Management practices make the digital twin increasingly efficient as they can focus data analysis on case by case basis. You truly do not want to know every conceivable piece of information about the physical twin, do you? As digital twins will deal with big data, there will be an ever-increasing need for systems that can crunch all the numbers and help you answer plain language questions such as ‘Is the new security system putting strain on the electricity bill? ‘How will the thermal insulation I have installed deteriorate over the years? ‘When do I need to change the water heater?’. In the futuristic world of digital twins there are still problems to be solved by BIM. Imagine that your friend Joe who lives in a different country asks you to compare the u-values of your houses’ thermal envelopes. However, when Joe types ‘u-value’ in his home’s digital twin interface he gets no results. Where Joe lives, this characteristic is called ‘thermal transmittance’. If Joe is a non-expert and doesn’t know that these terms are the same he might be very confused. If we want smart technologies to do complex comparison and calculations in the future, we really have to think of how we can help them today. At European level where policies and standards for digital construction are made, BIM is not merely about CAD models. It is about the management of consistent, traceable data that follows common structures, common definitions and common logic. In order to create rules and automation paths for machines we need to pull our sleeves up and start digitising the data that is available in standards today. Starting from what test methods are used, what machines, what units, how characteristics are defined and much more. We can then create intricate mappings between different local contexts. The technology for this is available today. Product Data Templates are used to describe and define the product. 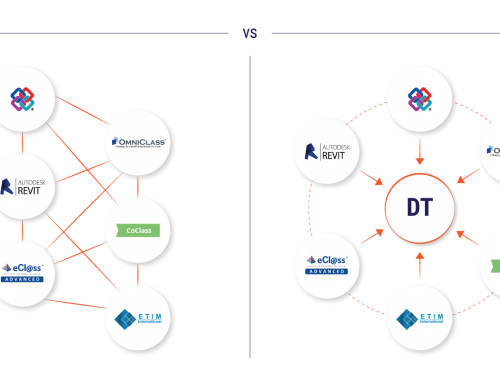 Product Data Templates are also built upon special ontologies called ‘digital data dictionaries’ that enable the mapping of similar concepts to unique codes so that machines can read ‘meaning’ no matter the local differences in semantics. 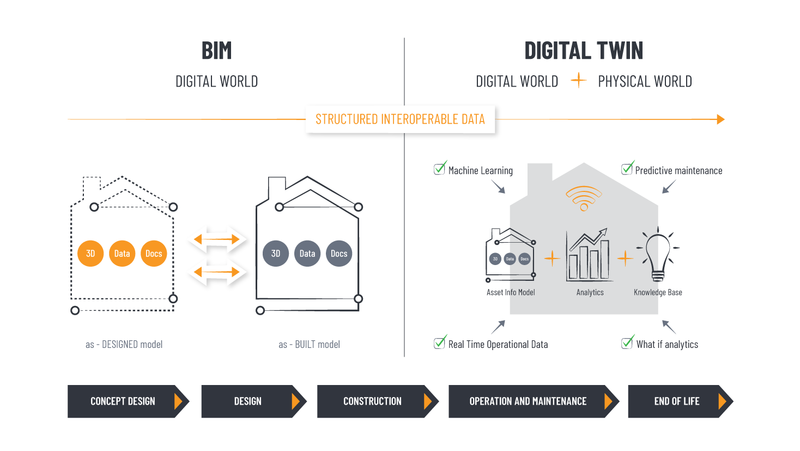 This is what BIM geeks have been exciting about for the last couple of years and it has a direct impact on digital twins. Digital twins are the new inspiring frontier and maybe the next step after BIM, but in practical terms, we have not been able to master the digital part of construction yet. 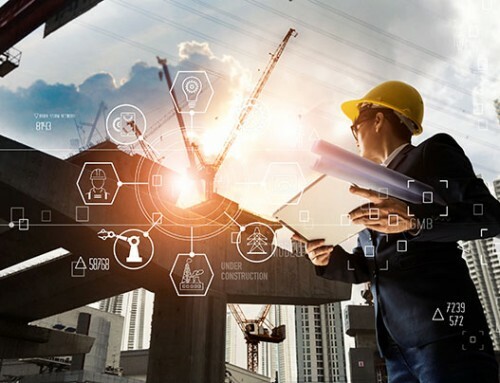 In order to be able to leverage the opportunities brought about by the tomorrow’s cyber-physical systems we have to focus on getting digital modelling right in construction. The technology is available. The processes? With the help of international standardisation bodies – we are getting there. The people? We are yet to see the numerous benefits of digitising the construction site through the eyes of the people. If the benefit is truly there, we will be able to perceive it, measure it and improve it. This is how we will go from today’s construction to tomorrow’s.